Note: There are spoilers littered throughout this review. In the movie review section, I will note when one is coming up, but there are a few in the features section. Day & Night Theatrical Short (6:02) – The short film that appeared before Toy Story 3 in theaters has been included here and is just as fun as it was when I first saw it. It also looks pretty good on the small screen although the 3D version looked fantastic. Filmmakers’ Commentary – This is a commentary track with Director Lee Unkrich and Producer Darla K. Anderson providing some bits of information about the story, animation and voice talents, new and old. It’s an engaging track that is on par with the first two films, although getting a few more people involved would’ve been nice (Tim Allen maybe?). Buzz Lightyear Mission Logs: The Science of Adventure (4:25) – These featurettes were made in conjunction with NASA and other editions were included on the Toy Story 1 & 2 Blu-rays. It’s a fun featurette for the kids to watch and learn about space and what they do. Paths to Pixar: Editorial (4:40) – Similar to the “Setting Story in Motion”, this featurette focuses on the editing process from editors at Pixar and how they go about cutting a film. Studio Stories (TRT 7:03) – There are three stories included and if you don’t know what a “Studio Story” is, it’s a simple animation narrated by an employee at Pixar relaying a story. Here’s the breakdown – ‘Where’s Gordon?’ (2:18), ‘Cereal Bar’ (1:38) and ‘Clean Start’ (3:07). These are fun stories that are worth checking out. Toys! (6:39) – How many toys are in the film? Members of the crew talk about rebuilding the old characters (because of advancements in technology since Toy Story 3) and creating new ones. The Gang’s All Here (10:24) – This featurette goes over the cast from the old crew to the newcomers including Ned Beatty, Michael Keaton, Whoopi Goldberg and Jeff Garlin. I always enjoy the features where we get to see the actors recording their lines as well as getting their insights into voicing the characters (and the grunts they have to do). A Toy’s Eye View: Creating a Whole New Land (5:29) – The featurette isn’t about creating the day care center but instead is a sneak peek at the Toy Story-themed playland at Hong Kong Disneyland. 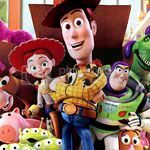 Toy Story 3 is presented with a 1.78 aspect ratio (theatrically it was 1.85) and looks very very very good (is that enough?) on DVD and I’d say it might be one of the best looking standard def transfers I’ve seen in quite a bit. I didn’t notice any pixilation and the colors pop off the screen while black levels are also nice. The disc features 2.0 and 5.1 EX Dolby Digital tracks with, unless it was just my player, the 2.0 track being the default one so be sure to change it on the menu. The audio has nice depth to it between the train robbery/rescue in the opening sequence, the general dialogue throughout the entire film to towards the end at the dump; it’s all quite even throughout. Like the picture, I don’t come across that many great sounding DVDs, but this is one of the better one’s in a while. 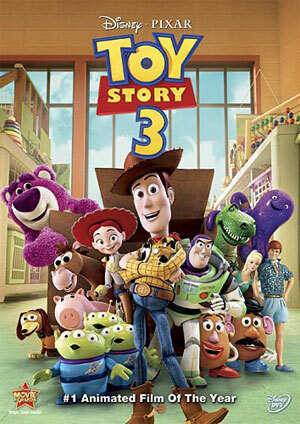 Overall, Toy Story 3 is a heartwarming, bittersweet and funny film that both kids and adults will absolutely love – and I would argue that the adults may find a more emotional impact especially if you were a child when the first film was released.